Thousands of men and women, young and old gathered for the annual March for Life in Washington D.C. on Jan. 18th. 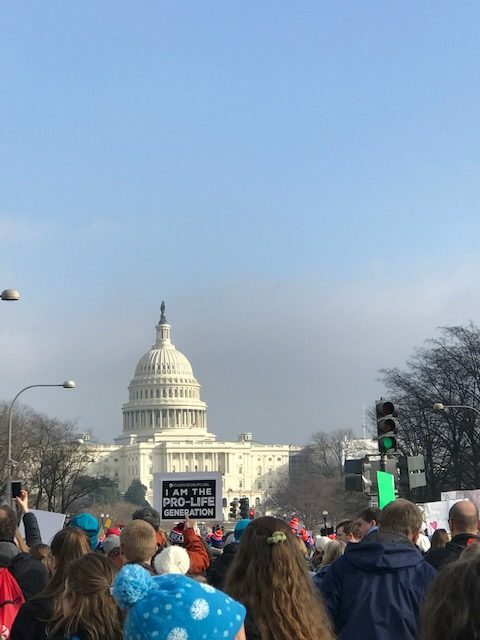 The 2019 March for Life commemorated the 46th anniversary of Roe vs. Wade, the Supreme Court decision which legalized abortion throughout the United States. The Catholic Church strongly opposes the court’s decision and states in the Catechism of the Catholic Church par. #2270, “Human life must be respected and protected absolutely from the moment of conception. From the first moment of his existence, a human being must be recognized as having the rights of a person – among which is the inviolable right of every innocent being to life.” Not only were we marching for anti-abortion causes, but also for an end to euthanasia and for the protection of the dignity of all human beings especially refugees and the homeless people living in poverty. Mundelein Seminary brought a group of 34 seminarians to join in the important event, and I was chosen to stand up alongside my seminarian brothers, trudging along to defend this important right to life at all stages of human existence. As it was my first time at the March for Life in D.C., I did not know exactly what to expect but I knew that its annually the largest pro-life gathering in the country. 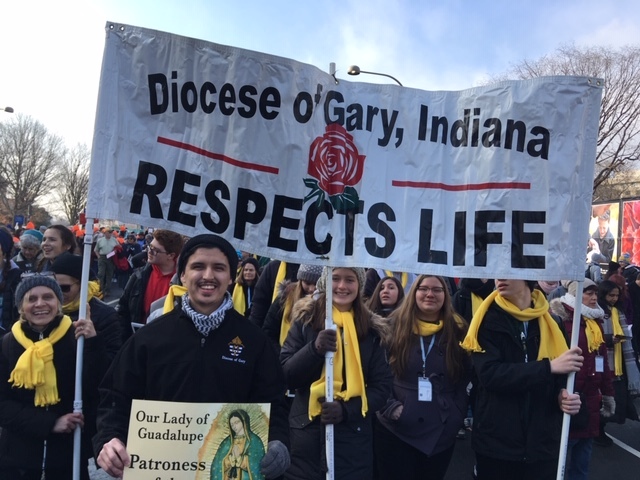 The number of pro-life advocates who were below the age of 30 was astonishing; many seminarians came from across the country as well as many young people from schools, churches, and other communities. We started the March for Life on Thursday evening with the Vigil Mass, which was held at the Basilica of the National Shrine of the Immaculate Conception, in Washington D.C. The National Shrine was completed in 1959 and stands as the largest church in the United States, with over 80 side chapels and even a fancy diner and gift shop in the basement! Friday morning was the Youth Rally and Mass, held at the Capital One Arena in Washington D.C. Over 20,000 lay youth and adults joined with seminarians, religious sisters and brothers, priests, and bishops for this spectacular rally and Mass to start off the March with praise and worship, thanksgiving, and supplication to our very merciful Lord. Afterwards, many groups gathered on the National Mall to hear speakers including Vice President Mike Pence and Rep. Dan Lipinski (D-IL) along with Church leaders and women and men who take an active role in the protection of all human life, from conception to natural death. The March itself was a perspiring trek up Constitution Avenue past the Capitol and Supreme Court buildings. It involved much prayer and reflection, respectful conversation and joyful singing, as we were not only mourning the enormous losses & horrors of abortion and standing up against the culture of death, but also celebrating that so many souls across the world work hard to stand up for a right to life. Perhaps the most eye-opening witness for me, came from the men and women who lined the street in the Silent No More Campaign, a project aimed at sharing the horrors of abortions that they have had personally, affecting their lives in horrific ways. They also stand up as witnesses of the hope of forgiveness and Divine Mercy which God offers to all victims. My main takeaway from this pilgrimage to Washington D.C. is that many people are working hard to stand up for life, but more must be done, and it begins with each one of us, in our own witness. We stand up for life by sharing Christ, who is life, with others through the message of life as he says in John 10:10, “I have come that they may have life, and have it to the full.” We can do this by getting involved with the Knights of Columbus or Lake County Right to Life, who work so diligently in defending human life. Even greater in our Christian calling, we must share the message of life by seeking to encounter those who we love, those who are hurting the most in our lives and on our streets, seeking to relieve them of there distress by our prayers and loving actions.